Along Came Poppy: Our Eden Project Visit - Three generations, a double buggy and an electric wheelchair! Quite a long way for you though :) But yes worth a visit! I was amazed by the cool room! But a brilliant idea. I'm not sure if we were brave or just daft to go on the hottest day lol!! Oh you were just half an hour from me too! 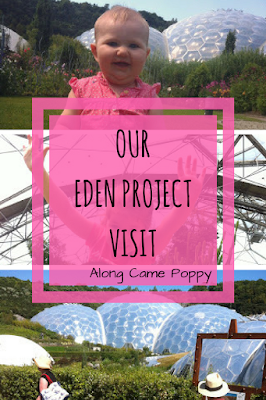 the Eden project really is great for all ages and very boggy and wheelchair friendly. It is a day out I recommend to many of my guests as the facilities for families get better each year. the under 5's soft play is something new that I've not seen, but sounds like a sensible addition. I know how popular our one is here. the Meditteranean Biome is my favourite too, it almost smells authentic with the plants and birds in there and so much more comfortable than the tropical biome. so pleased you had a good day there. Yes thought out very well and prices reasonable, especially as we got the season ticket and ended up going back for a second day! It's an amazing place isn't it - we spent most of a day there and didn't get to see all of it. I can only imagine how hot it was in the rainforest biome though! I think that was my favourite part. Its my dream to go in there since I arrive here in the UK! I think its because of the hottest Biome reminds me of home. Sadly still havent visited the place and reading your post made me want to see it more! Oh do visit Pixiedusk, such a beautiful place :) Where are you from? We had a really lovely day, but it was hot and we would not have managed without the electric wheelchair. The sensory garden was beautiful and I want some of the sculptured metal fencing that the sweet peas were climbing up!!! Oh wow, I went about 10 years ago... I'd love to go back. Sounds like it's brilliant for children too. Glad you had such a lovely day.